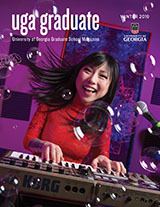 The University of Georgia Graduate School’s Office of Recruitment and Diversity Initiatives promotes excellence in graduate education by recruiting top students to the University of Georgia. Every effort is made to facilitate a smooth transition for new students through their graduation as well as heighten the graduate experience of all students. Our office is ready to assist you! While striving to increase overall enrollment, the Graduate School also seeks to promote diversity by encouraging the enrollment of students from historically underrepresented groups. The Graduate School’s definition of underrepresented includes race/ethnicity, gender within discipline, first generation, non-traditional age and/or a self-identified aspect of a uniquely diverse background. As part of the Graduate School’s overarching recruitment and retention programming, we offer several programs targeted to students from underrepresented backgrounds under the banner of the “Pathways Program”.